Over a dozen senior leaders have either left the party or were expelled for anti-party activities, while some more are likely to desert the party in the coming days. SRI NAGAR: Hit by a seemingly unending stream of desertions and facing open dissent and rebellion in the ranks, the People’s Democratic Party (PDP), which, not too long ago, was running the state in coalition with the Bharatiya Janata Party (BJP), is in the grip of a steadily worsening leadership crisis. The rebellion in the PDP started immediately after the fall of the Mehbooba-led PDP-BJP coalition government on June 19 last year, following withdrawal of support by the saffron party. Some senior party leaders, including former ministers, accused Mufti of nepotism and favouritism in running the party affairs. 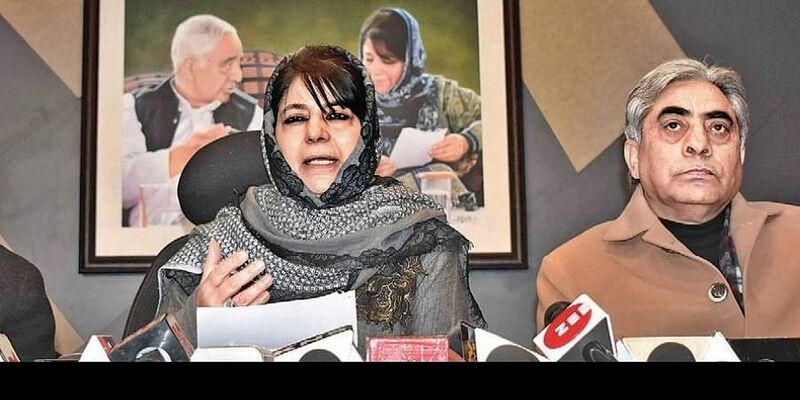 During her time as CM, Mufti had inducted her filmmaker brother into the state cabinet as tourism minister and also assigned key portfolios to her close relatives. The move did not go down well with the party leaders and they were waiting for the opportune time to strike back. The influential Shia leader and ex-minister Imran Reza Ansari was the first to revolt against Mufti by accusing her of turning PDP into a ‘Family Democratic Party’. After dissolution of the Assembly, the disgruntled PDP leaders began to leave the party. Some were also expelled before they could announce their plain to quit and join other parties. So far two ex Finance Ministers and four ex-ministers and two ex-MLAs have left the party. Those leaving the party include Haseeb Drabu (ex-Finance Minister and co-author of Agenda of Alliance framed by PDP and BJP for running coalition government), Syed Altaf Bukhari (ex-finance Minister), Imran Ansari (ex-minister), Syed Basharat Bukhari (ex-minister), Javed Mustafa Mir (ex-minister), Abid Ansari (ex-MLA), Abbas Wani (ex-MLA), Yasir Reshi (MLC), Saif-ud-Din Bhat (MLC) and Pir Mohammad Hussain (ex-minister). Some other leaders have also quit the party. Some of them left PDP to either join the National Conference or separatist-turned-mainstream politician Sajjad Gani Lone’s Peoples Conference. Sources said some more PDP leaders may leave the party in the coming days, as Altaf Bukhari, who was expelled by party on Saturday, is making an attempt to float the Third Front. Over a dozen senior leaders have either left the People’s Democratic Party or were expelled for anti-party activities, while some more are likely to desert the party in the coming day. The rebellion in the party started when the BJP withdraw support to the PDP-led government on July 19 last year. The former CM said that some extremist elements in Jammu are branding the Muslims and nomads as outsiders and are threatening them with a 1947-like situation. She said the minorities have been loyal to the country.